Merrillville can be a beautiful place to call home. We’re lucky here to be given a front row seat to every major season throughout the year. From June to August it can be tough to bear the heat waves that roll through. During these heat waves, you’ll be glad to have a working air conditioner at home. 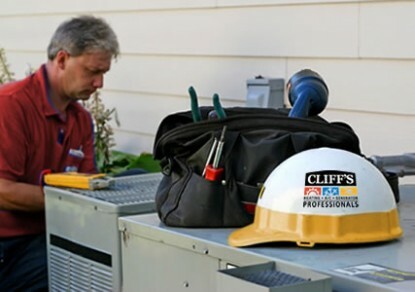 When your air conditioner isn’t working, you’ll be glad to have Cliff’s Heating & Air in your contact list. We are a fully staffed team of certified cooling professionals. We are a family-owned business with nearly 40 years of experience. We offer competitive rates and emergency air conditioning repair services. Here at Cliff’s Heating & Air, we understand the stress that can come when your air conditioner decides to quit working. In these situations, you want to have a reliable company ready to help you out. Here is what Cliff’s Heating & Air can do for your on your next AC repair call in Merrillville. When it comes time to replace your old air conditioner or simply to install a new one in your home or business, you need a team that knows air conditioners well. Our team of highly-trained professionals always go above and beyond to supply you with an air conditioner that works perfectly for your needs. We offer free in-home consultations and estimates for AC installations and are ready to help you cool down today. We treat our car to proper maintenance and frequent tune-ups, so why don’t we do the same for our cooling systems? The truth is that if you want your air conditioner to work hard for you, you have to show it some appreciation. Our technicians can come in for an inspection and tune-up to get your air conditioning system ready for the summer. With summer rapidly approaching, it’s time to start thinking about keeping cool. Cliff’s Heating & Air services Merrillville, IN and the surrounding areas. We offer competitive rates and quality work and are available today to help you out.